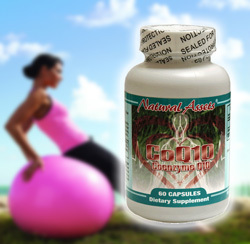 Natural Assets' Coenzyme Q10 is a nutrient that naturally occurs in every cell in the body. CoQ10 benefits are well established and published over 600 Medical Papers. Recommended DOSAGE: As a dietary supplement for adults. Take one to two capsules daily with each meal. Protecting LDL Cholesterol from Oxidation & Plaque Formation. Coenzyme Q10 (CoQ10) is produced by the human body and is necessary for the basic functioning of cells. CoQ10 levels are reported to decrease with age and to be low in patients with some chronic diseases such as heart conditions, muscular dystrophies, Parkinson's disease, cancer, diabetes, and HIV/AIDS. Some prescription drugs may also lower CoQ10 levels. Furthermore, Coenzyme Q10 (CoQ10) is a vitamin-like substance that functions as an antioxidant, preventing free-radical damage at the cellular level. It has strong & important anti-aging properties. Levels of CoQ10 in the body can be increased by taking CoQ10 supplements. CoQ10 has been used, recommended, or studied for numerous conditions. In the mid-1970's, the Japanese perfected the technology to produce pure CoQ10 in quantities sufficient for large studies and clinical trials. As a result of one study, Peter Mitchell received the Nobel Prize in 1978 for his contribution to the understanding of biological energy transfer which includes the vital role of CoQ10 in the body's energy systems. In 1986 a prominent CoQ10 researcher, Professor Karl Folkers received the Priestly Medal and the National Medal of Science from President ush in 1990 for his work with CoQ10. Each cell in the body needs a source of energy to survive, so cells break down sugars, fats, and amino acids to make energy. Small enclosures within cells that make this energy are called mitochondria. CoQ10 exists naturally in our mitochondria and carries electrons involved in energy metabolism. CoQ10 is essential in the production of adenosine triphosphate (ATP), the basic energy molecule of each cell. In the bloodstream, CoQ10 is mainly transported by lipoproteins such as LDL (low-density lipoprotein) and HDL (high-density lipoprotein). It is thought that CoQ10 is one of the first antioxidants to be depleted when LDL is subjected to oxidation. Hence, CoQ10 is an important nutrient that prevents the oxidation of lipoproteins, thus potentially reducing the risk of arteries from forming plaques and getting damaged. Besides being fundamental to energy production, CoQ10 is also essential for helping to protect cell walls and neutralize free radical that can damage DNA, organ tissues, and even your skin. There are over 300 published papers on the heart disease-preventing roles of CoQ10. In addition, promising research continues to emerge that examine CoQ1o's role in brain, nerve, skin, and oral health. But it's crucial to note that your organs have the highest demand for uninterrupted energy - so you MUST have plenty of CoQ10 to meet your body's demands. Your body depends on CoQ10 to keep your heart muscle beating, your blood flowing, and your liver, kidneys, and lungs working properly. Atherosclerosis, is a chronic inflammatory disease. It may be a consequence of several risk factors such as smoking, high blood pressure or an unhealthy, fatty diet. Atherosclerosis can lead to the formation of blood clots, which may in turn cause strokes and heart attacks. So far, the main focus of attention has been on the prevention of atherosclerosis and providing information about the risk factors and ways to improve cardiovascular health. Heart Disease - In the early 1980's, there was a considerable acceleration in interest in CoQ10 and in both the number and size of clinical trials. For the past 14 years, the great bulk of clinical work with CoQ10 has focused on heart disease. Many of these clinical studies centered on the treatment of heart disease and were remarkably consistent in their conclusions: that treatment with CoQ10 significantly improved heart muscle function while producing no adverse effects or drug interactions. Parkinson's disease - There is promising human evidence for the use of CoQ10 in the treatment of Parkinson's disease. Strong evidence that CoQ10 could help slow the progression of the neurodegenerative disease Parkinson's. A small but promising study found that coenzyme CoQ10 may help stop the nerve cell death that characterizes Parkinson's disease.